Pierre Choderlos de Laclos classic 18th century epistolary novel, Les Liaisons Dangereuses, has inspired a number of screen and stage adaptations, most popular of which is the Stephen Frears movie, Dangerous Liaisons (1988), starring Oscar nominees Glenn Close and John Malkovich. Tanghalang Pilipino (TP) has chosen to close its 28th season with a new adaptation of the French novel, starring some of the country’s most notable performers not only from the stage but from television and movies as well. 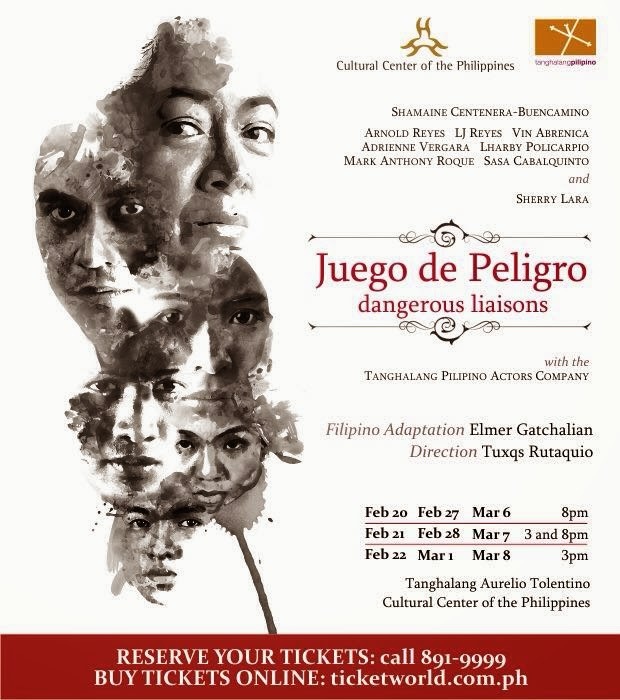 Written by award-winning playwright Elmer Gatchalian and directed by TP Associate Artistic Director Tuxqs Rutaquio, this adaptation transports the story of the novel to Manila in the 1890s, a few years before the mass revolt led by Andres Bonifacio against the Spanish regime. The infamous characters of the novel, Marquise de Merteuil and Vicomte de Valmont, now have their Hispanic counterparts—Señora Margarita and Señor Vicente. Their status as peninsulares of the colony has somewhat given them a sense of entitlement to prey on people who belong in the lower ranks. When Señora Margarita asks her former lover Señor Vicente to seduce the young and virginal Cecilia, he proposes to her another devious plan—he will make the deeply religious and recently married mestiza Señora Teresa fall in love with him. While waiting for his plan to come to fruition, Señora Margarita proceeds to corrupt the indio Daniel who is madly in love with Cecilia. This game of conquest will set in motion a series of tragic events that will challenge Margarita and Vicente’s position as the self-proclaimed—and rather depraved—patriots of their motherland. Philippine theater icon and 2012 Asian Film Awards’ Best Supporting Actress Shamaine Centenera-Buencamino leads the stellar cast as she plays the iconic role of Señora Margarita. Centenera-Buencamino is joined by Cinemalaya Best Supporting Actor Arnold Reyes as the seductively charming Señor Vicente. Cinemalaya Best Supporting Actress LJ Reyes as Señora Teresa and TV actor Vin Abrenica who plays the role of Daniel. Alternating for the role of Daniel is newcomer Lharby Policarpio. Also in the cast are veteran TV and theater actress Sherry Lara, Adrienne Vergara and Sasa Cabalquinto, as well as some of the most promising talents from the Tanghalang Pilipino Actors Company: Jonathan Tadioan, Raquel Pareño, Aldo Vencilao and Lhorvie Nuevo. An impressive Artistic Team behind this production includes Giselle Garcia for the dramaturgy, John Batalla for the lighting design, Jed Balsamo for the sound design, and James Reyes, for the costumes. For more inquiries, call Tanghalang Pilipino at 8321125 loc. 1621. Tickets are also available at ticketworld.com.ph. Please present valid ID to avail the discount on the regular price (Discounted tickets for students, senior citizens, government employees, military employees & Persons with Disability (PWD).